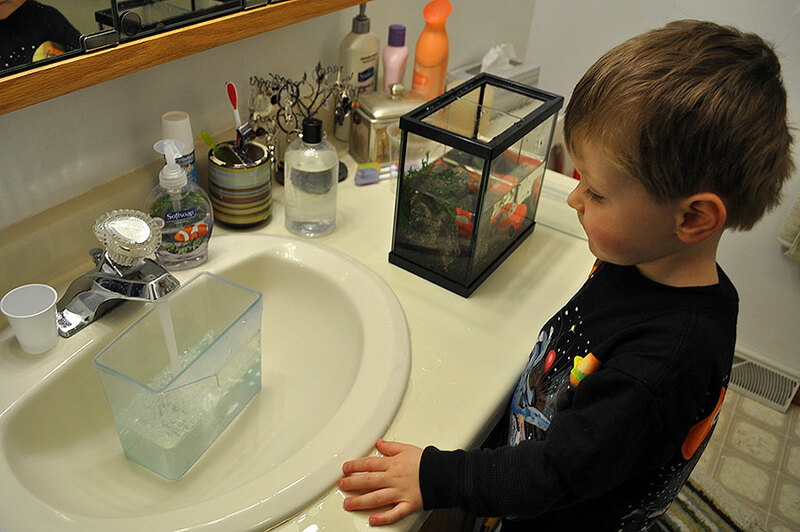 Introducing my 3 year old child to his first pet fish – success! 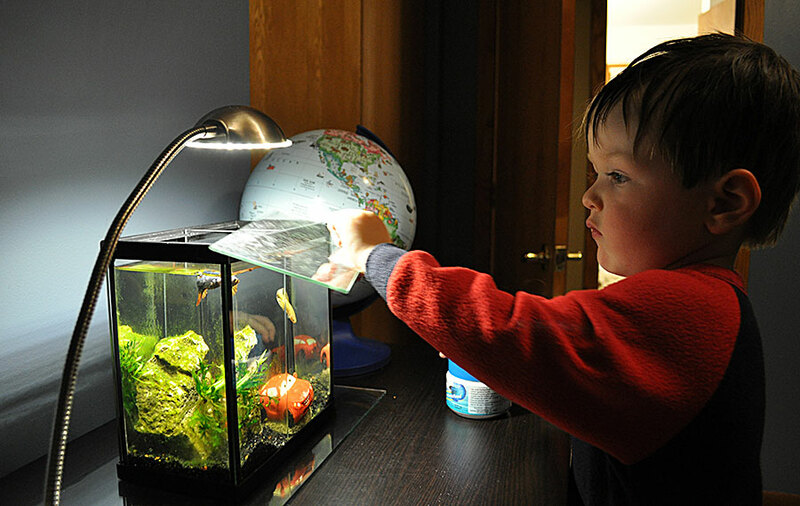 Ethan’s Deep Blue Professional 2-Way Betta Aquarium, lit with a LED desk lamp purchased at Office Max. Ethan had done fantastically with his first fish, Swimmy. Ethan definitely learned to respect the fact that the tank is made out of glass, including the lid which he carefully removes all on his own (he dropped and broke a dinner plate once; that experience was all he needed to understand the consequences of mishandling something like a glass lid). Ethan’s fingers lack the dexterity to consistently pick out 5 unique pellets, so sometimes I have to help. Sure, we’ve had small pellet spills too. Ethan feeding his pet bettas like he does every night. 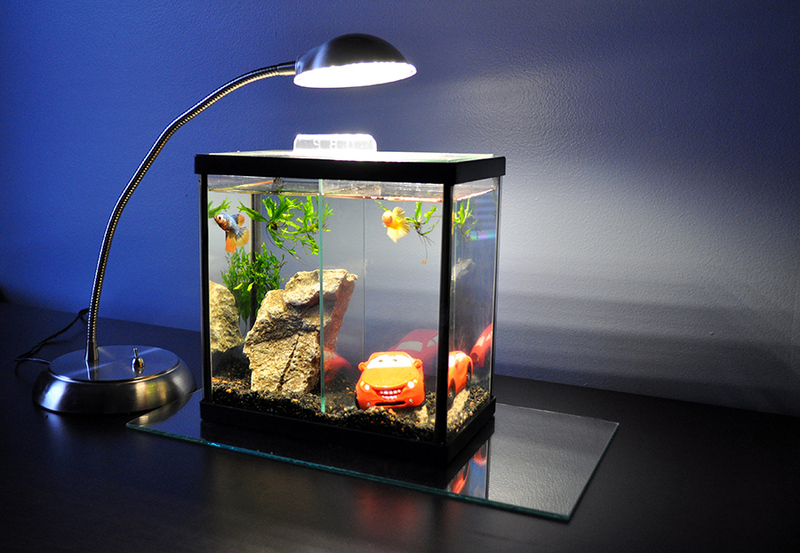 One of the instructions that Tony (from The Betta Shop) didn’t mention was lighting, granted most bettas are probably kept without any direct light, but I gave Ethan’s tank a LED desk lamp for illumination. Arguably, remembering to turn on the light in the morning, and turn it off at night, has been one of the most consistently successful responsibilities Ethan has had with his fish so far. Ethan manually removing 50% of his aquarium water. When it comes time to do our water change, I found it easiest to move the entire tank into the bathroom. Once there, Ethan can scoop out water from the tank with a plastic drinking cup. He understands to take out about half of the water in the tank. He also understands to check the cup to make sure he hasn’t scooped out the fish (he happened to catch a fish in a cup this past weekend) before pouring the water down the drain. Once we’ve drained our water, we turn on the faucet and mix hot and cold water. 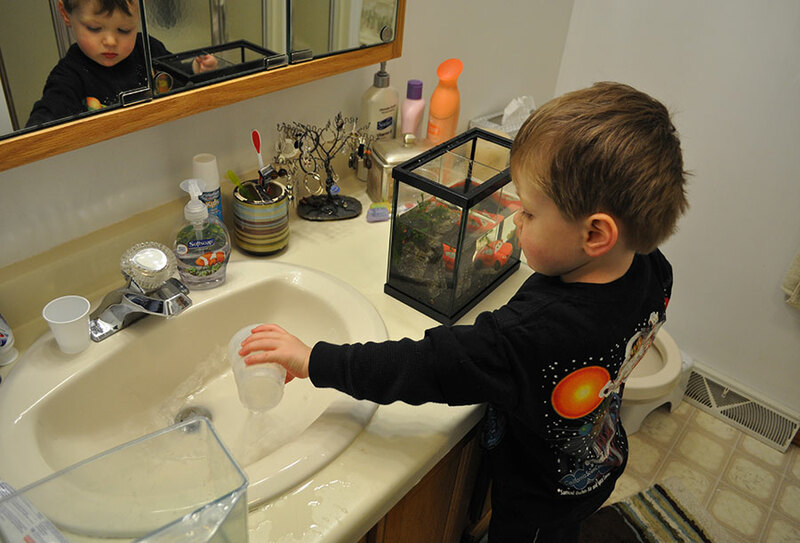 Ethan is already learning how to be a human aquarium thermometer, using his finger to test the tank water, then the faucet, then the tank, then the faucet, until we match temperatures. From there, we use a ½ gallon specimen cup to collect water, and Ethan adds a small shot of dechlorinator to the cup as water is going in. I handle pouring (he helps, hands on the cup but not actually doing anything). I used to clean up any spilled water and drips, but lately Ethan has started doing that on his own! Once it’s all done, I still carry the tank to Ethan’s room (pretty sure I’ll be doing that for several years yet). Waiting on the replacement water. I’m so proud to say that Ethan earned his second fish a little early; I tried to sneak into his room around 2 AM on the morning of his birthday to add his second fish to the tank. Of course, I woke him up…he knew I was doing something with the tank, but he went right back to bed when told to do so. He found his second pet fish (now named “Chuck”), when he awoke for his birthday; there was definite excitement. Ethan was pretty proud of himself to make the connection that I had snuck into his bedroom at night to add the fish to his aquarium; guess I’ll have to try harder in the future! Ethan’s second betta, a Orange/Yellow and Blue Halfmoon Plakat named Chuck. You’d think that Swimmy and Chuck would have been drowned out by all the other presents and excitement of grandparents on Ethan’s birthday, but a month later, Ethan remains a faithful and responsible caretaker of Swimmy and Chuck. I couldn’t have asked for a better outcome. I can’t say how long Swimmy and Chuck will keep their hold on my son, but it’s been over a month and he’s only three, so I consider myself incredibly lucky! That said, I went into this knowing that in the worst case scenario, Swimmy and Chuck would have wound up in the basement with the 20 or so bettas I’ve started hording from the three (yes, 3!) 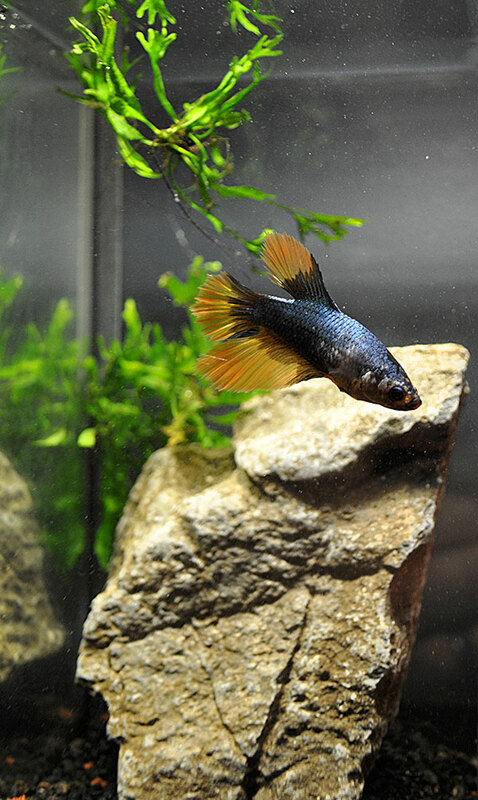 betta specialty shops I discovered in St. Paul, MN (Betta World, Beejay’s Bettas and The Betta Shop). But that’s another story…maybe for a future issue of AMAZONAS magazine.